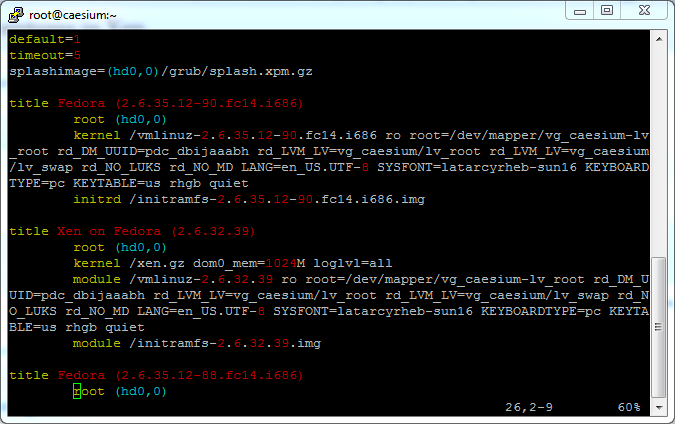 Now that Xen and a dom0-capable kernel have been installed, it’s time to combine the two. Officially, the easiest way to modify the grub configuration file is to use grubby, a tool designed specifically to do so. Unfortunately, it doesn’t support the syntax Xen requires (yet, there’s a bug report filed against it about this problem). You can do this either at the desktop (using GUI text editing programs such as gedit) or the command line (using vim or other text editors). The syntax Xen requires is unique – Xen works by starting the Xen hypervisor, then it starts your OS to administer and interact with the Xen hypervisor. Hence, it needs to know both the location of your kernel and the initial RAM disk image (aka the file named initramfs) when booting your computer. Since I compiled my own kernel and copied it over to /boot, I just needed to specify the kernel location. grubby --title="Xen on Fedora Test" --add-kernel=/boot/vmlinuz-2.6.32.39 --copy-default --add-multiboot=/boot/xen.gz --mbargs="dom0_mem=1024M loglvl=all"
Of particular note is the mbargs=”dom0_mem=1024M loglvl=all” portion. This specifies the options passed to the Xen hypervisor. In this case, I’ve set it so that Domain0 will be limited to 1GB of RAM, and that the hypervisor will log every event. The –copy-default option saves copying the kernel options. Don’t worry if it’s not exactly the same, the kernel options and filenames will no doubt vary. to get them to start automatically. This entry was posted on May 14, 2011, 7:59 pm by Kyle Lexmond and is filed under Uncategorized. You can follow any responses to this entry through RSS 2.0. You can leave a response, or trackback from your own site.